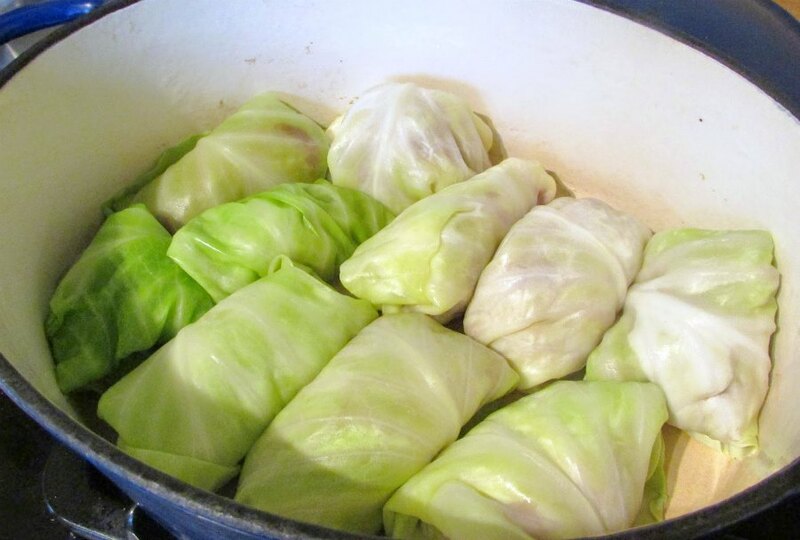 Stuffed cabbage is a staple of my husband's uncle's diet. He was nice enough to share his recipe with us so now we can all have this hearty and fun dinner! Hi, my name is Carlee, and I am a rice hoarder. Who knew I had so much rice?! We used to use rice quite a bit. 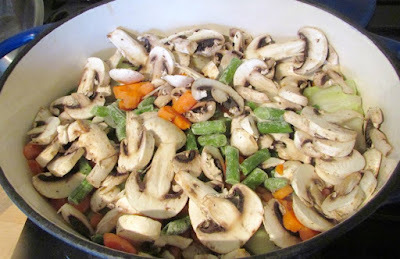 I was the queen of one pot dinners. Sometimes two pots. Take meat, veggies, spices, add rice, stir, eat. Or take meat, veggies, spices, sauce, serve over rice, eat. It's not like we had rice every day. I sometimes subbed in quinoa or pasta! If you think about it you can do that formula a million ways; fajitas served over rice instead of in a shell, chicken and rice, all sorts of curries. You can put an Italian spin on it, or Mexican, or Spanish, or Thai, or Indian, or Chinese. Or you throw in a can of cream of mushroom... because, let's be honest, it just makes things good! Anyway, that is my excuse for having as much rice as I just found in my pantry. I have made my way through most of the case of heirloom organic brown rice I bought (I have four pounds left). I have a two pound bag of brown rice in case somehow I used the other up without noticing. Then I have the pound of quinoa for when rice just doesn't seem right. Oh, and the 5 pounds of jasmine rice for the coconut curries (ooh, yum! That sounds good right now!). And in the case of a dire emergency, I do have a box of instant brown rice. Oh, and some couscous, and a bunch of pasta... but I digress. The only thing any of that has to do with the recipe, is that it uses rice. Today I used the heirloom organic brown rice, in case you were wondering. But, really any rice would do. I don't believe I have ever had a golumpki. Or any kind of cabbage roll, for that matter. However, I have heard about Greg's Golumpki. 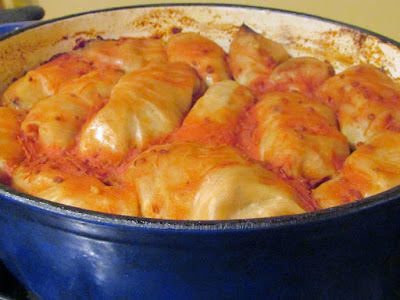 If Matt's Uncle Greg's name is mentioned alongside a food, there is a really good chance it is either his potato dumplings or these. So, I set off to make a batch. His recipe called for 4 pounds of ground chuck. I wasn't quite ready to commit to that many leftovers, so I scaled back a bit. They were quite tasty! I would definitely add more salt next time. I didn't add any table salt due to the soy sauce, but more salt would have been better. Luckily it is always easier to sprinkle some salt on at the table than remove it if you went to far! 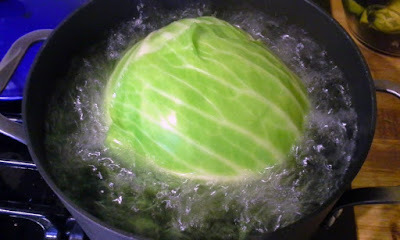 Take a scoop of the meat mixture and wrap it in a cabbage leaf. Wrap it like you would a burrito or egg roll. 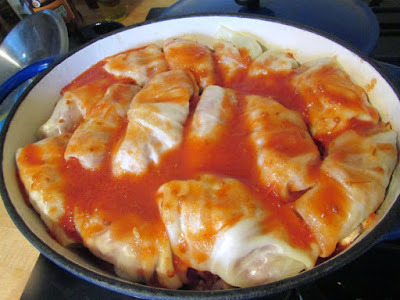 I put probably a scant 1/4 cup of meat mixture on a leaf, then rolled it folding the tops and bottoms in as I went. Repeat with cabbage rolls until you run out of room or ingredients. *Greg suggests picking a couple spices from the following: thyme, nutmeg, ground mustard, ground cumin, marjoram, garam masala or cloves. He usually uses cloves and one other. Today I used the mustard and marjoram. Those look really good. Will need to try these.